Tribes Overall: "Everything worked like clockwork, trains, boats and planes. No delays checking into hotels and all of them clean comfortable and characterful. 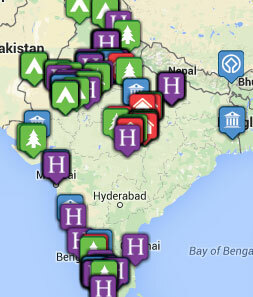 All the places we visited met or exceeded expectations." Tribes Service: "Paul Cook provided us with an exceptional service prior to departure and what we got was 'what it said on the can'. All the documentation was in order and the Vamoose app proved to be a real value added extra." Guides: "All guides were knowledgeable, and enthusiastic. However, some guides were a little more empathetic to our needs than others. The guide in Jaipur was superb, prepared to go off message to answer questions on politics and culture and leaving us free to shop at our leisure. In contrast, we arrived 'templed out' by the time we arrived in Varanasi and despite telling the guide we needed more free time for shopping and relaxation he insisted on giving us an extended guide to Hindu philosophy and visiting yet more temples! On the whole drivers were skilled and careful allowing for the fact that the overall driving experience in India is very different to the UK! " Social & Environmental Responsibility: "It gave us a real understanding of how Modi's government is taking steps to improve measures to combat climate change (i.e. wind farms) and infrastructure (many new road and rail schemes in evidence). At the same time it showed us the difficulties India faces, a still fast growing population, need for better health and and very heavy traffic." A small guest house with real family history. The owner was on hand to lend assistance where required and rooms clean and comfortable with a balcony which looked out on a pleasant garden and parrots to wake us up. Fantastic bedroom (like something from the Arabian Nights). Wonderful views across Jaiselmer city. Food average. A tropical Oasis at the end of a bustling village close to the desert. Very relaxed atmosphere, wonderful food, plenty of shade when needed. We could see why Chatwin & Dalrymple found it so conducive to writing here. A very relaxed informal guest house with a wonderful rooftop restaurant & pool. Very friendly and efficient staff. The whole of Rajasthan was incredible, Taj Mahal stunning. However what made this trip so successful for me and my wife were three magic moments. We are a a group of three couples who have known each other for 30-40 years and have travelled to countries across the world together for the past 15 years visiting southern India 10 years ago. On this occasion we travelled together throughout Rajasthan with one couple setting off for the Ranthambone tiger reserve while the rest of us continued on to Varanasi and Shimla. This was a bit of of a sentimental journey for me as I had first travelled through northern India by landrover 47 years ago on my way to Khatmandu. I had fond memories of Varanasi and it was a place that I was keen to revisit. The evening Aarti ceremony proved the city hadn't lost its allure. As we rowed slowly along the Ganges amongst the smoke from funeral pyres mixed with the heavy scent of incense and heard the sound of the monks chanting against a background of bells, drums and conch shells, and while lighted candles floated past us, all against a backdrop of crumpling thousand year old temples, it proved a truly moving experience. It reminded me of the scene in 'Apocalypse Now' when Captain Willard first enters the kingdom of Colonel Kurtz, the difference - a sense of elation instead of fear! The second great moment occurred when we were on the toy train to Shimla. We shared a carriage with a group of Muslims from England who were on their way to visit a mosque. Along the way the train sopped at a small station where we all noticed a sign on the wall - "The Allah of Islam is the same as the God of the Christians and the Ishwar of Hindus". We all looked at each other and smiled. A magical moment! NB President Trump. The third momentous moment occurred at Colonels Retreat in Delhi. The owner, Arun Khanna had asked us where we were going and I mentioned Shimla, the reason being that my late father in law had served as a junior officer in the army between 1945 and Independence in 1947 spending some time in Roorkee and Shimla. 'What regiment?' asked Mr Khanna. 'Bengal Sappers & Miners' I replied. 'What a coincidence' he said, 'that's the same regiment as my father (the Colonel from which the hotel gets its name). I contacted my son and asked him to dig out a few photos from our attic and email them to me so I could forward them to Mr Khanna. This he did and on our return to Delhi 'The Colonel' (aged 92 but in fine fettle) met us for breakfast. This was a wonderful occasion and we discovered they both had a number of shared interests (history, cricket, etc). My father in law published a Brief History of the regiment (1939-46) together with a Unit Record of officers who served during this period, copies of which I will arrange to be sent on to the Colonel for deposit in the Regiments museum in India.